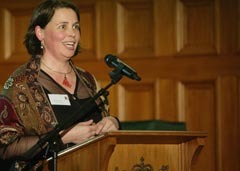 7 July 2009 A talented young writer who has overcome the odds, a mixed-ability dance company, a theatre project inspiring teenagers and the elderly, and a prison arts advocate were recognised last night at the Big âA' Awards 2009, presented at Parliament by Arts Access Aotearoa. Mark Lynds, a Northland/Auckland prison programme manager, awarded the Big ‘A’ Prison Arts Leadership Award 2009. The annual Big ‘A’ Awards are the only awards in New Zealand celebrating the outstanding achievements of individuals and organisations working to enhance the artistic lives of people who have been marginalised by the mainstream. Marianne Taylor, Executive Director of Arts Access Aotearoa, said the Big ‘A’ Awards pay tribute to the artistic work happening in New Zealand communities. 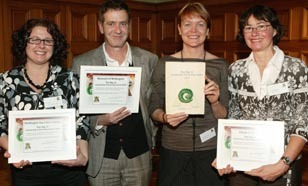 Arts Access Aotearoa called for nominations to the awards in December 2008. The four recipients were selected by a panel of judges, comprising Des Ripi, National Senior Adviser, Kaumatua, Department of Corrections; Lara Macgregor, Associate Artistic Director, The Court Theatre; Jo Randerson, artist and writer; and Marianne Taylor, Arts Access Aotearoa. received a “special mention” in the Big ‘A’ Community Partnership Award. The Hon. Judith Collins, Minister of Corrections, presented three of the awards. The Big ‘A’ Winton and Margaret Bear Young Artist Award was presented by Wellington writer Maggie Rainey-Smith, Chair of the Wellington branch of the New Zealand Society of Authors. 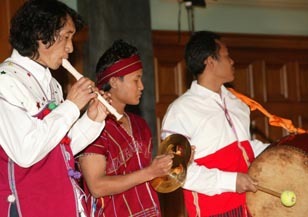 The evening also featured traditional Burmese music; a dance performance by Jolt Dance Company; artwork by artists from Spark Studio and Vincents Art Workshop; and a reading by Mary Dennis. Arts Access Aotearoa is the national voice for artists and communities that have been marginalised (e.g. refugees, mental health consumers, disconnected youth, the justice sector, and people with disabilities). Working in partnership with individuals and organisations, it helps ensure New Zealanders have access to the arts and can create, perform and develop their own arts. Arts Access Aotearoa receives major funding from Creative New Zealand, the Department of Corrections and the Ministry of Social Development. Click here to listen to Mary Dennis and former Wellington East Girls College student Jasmine Rangi Williams talk on Wellington Access Radio 783am. Original generation time 0.3480 seconds. Original generation time 1.4106 seconds. Cache Loaded in: 0.0005 seconds.